The Histologic Technician is not only the eyes of the pathologist but also the artist of the laboratory. The Histologic Technician’s canvas is a plain glass slide to which color and design will be added. The medium is not oil, clay or stone but the entire array of human, animal and plant bodies. The histotech's palette includes colors with names such as Hematoxylin, Eosin, and Alcian Blue pH 2.5, Acid Fast Green, Nuclear Fast Red, Carbol Fuchsin and others. The tools are not paintbrushes, chisels or drying ovens but have names such as tissue frossing, tissue processing, tissue embedding, microtome and microscopes. The student will learn the art of preparing quality slides for the pathologists in order to aid in diagnosis and treatment of medical problems in conjunction with surgical and clinical findings. The Associate in Science degree in Histologic Technology, teaches the knowledge of tissue and cellular structure. Students will develop skills in preparing, fixing processing, embedding, sectioning, and staining tissue, including brain, kidney, bone and muscle tissue. Actual surgical specimens are used in the laboratory settings. Histologic Technicians have a wide choice of practice settings. 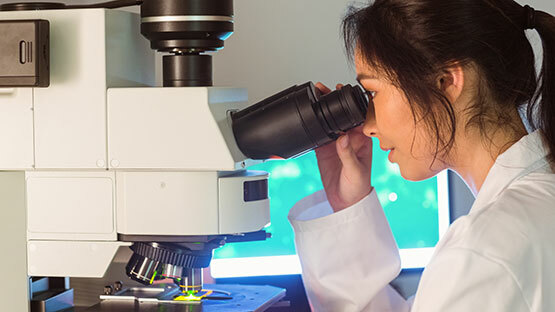 Hospitals, university research laboratories, private laboratories, public health facilities, industrial research, veterinary pathology laboratories, marine biology and forensic pathology laboratories, currently have positions open for qualified Histologic Technicians.